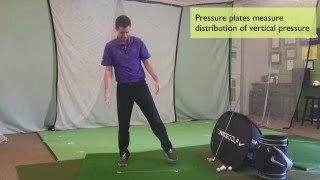 The lateral bump of the lower body is one of the critical moves for a solid golf swing. The tour average amount of shift during the downswing is 3 to 6 inches, and most of that shift happens before the arms drop below chest height. This movement is critical for getting a shallow angle of attack and a path that isn't too far to the left. Meaning, that this move is more critical for the longer clubs than it is for the shorter clubs. Once you can do the basic move make a backswing pivot and try to recreate the same bump feeling. The image that has helped many golfers is the old Motown dance move where the backup singers would slide to the left and push their right hand down to the right. Once the left hip is sufficiently higher than the right hip, go ahead and begin rotating into the Merry go round position that you practiced in the impact section. When you feel proficient you may hit 9 to 3 shots or even full swing shots trying to recreate the Jackson 5 feeling. For more ways to understand this movement, check out the Jackson 5 progressions in the related video section. Hanging Back? Check The Clubface Remedy a "hang back" in the context of a weight vs pressure shift. Back Wheels First - 3 Wood Understand a common cause for contact issues with fairway woods. Discussing Shaft Lean - Member Question The how and why of "shaft lean" is explained in this GSA insight. Turn From Behind - Hang Back Without Stalling Some golfers struggle with adding axis tilt. Learn how to add axis tilt without creating a low point problem. High Level Of The Slice Understand the simplest recipe for solving your slice problems. Insight - Force Vs Pressure Plates Are you confused by the difference between force and pressure plate data? Clear that up in this video. Trail Leg Push Vs Upper Body Fall The lateral movement during transition can be viewed in two ways by different golfers. Adductor Frisbee Squeeze Learn how to use the lead leg to pull the weight forward during transition.